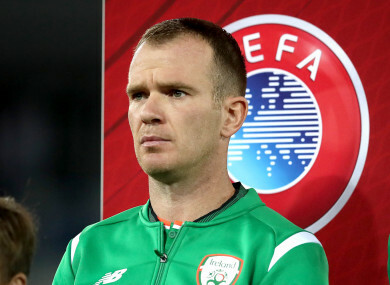 Glenn Whelan is set to retire from international duty. ROBBIE BRADY HAS paid tribute to Ireland team-mate Glenn Whelan as the experienced midfielder prepares to retire from international football. Whelan is set to lead the Boys in Green out on his 85th cap against Northern Ireland on Thursday, and Martin O’Neill confirmed last week that the appearance was likely to be the star’s last in a green jersey. “He’s had [over] 80 odd caps,” the Irish boss said. “He’s been excellent during his time here. “He will play some part of the [Northern Ireland] game, start the match, be captain of the team. Whelan tends to be a divisive figure among critics and supporters, with as many people pointing out what he cannot do, as those who highlight his strengths. While the player lacks the creativity and flair of other more naturally talented footballers, he certainly compensates with plenty of hard work, loyalty and commitment to the cause. And Robbie Brady feels the 34-year-old Aston Villa midfielder, despite rarely grabbing the headlines, has been an important of the Ireland team since making his debut against Serbia during Giovanni Trapattoni’s reign as manager in May 2008. “I’ve got on with Whelo since day one,” the Burnley star says. “He’s been fantastic for Ireland as you can see with the number of caps that he’s racked up. He’s a great lad and one of the best to have around the place. He’ll get some game time and it’ll be a special night for him and his family. He deserves all the plaudits for what he’s given this country and its national team. Email “'Maybe he didn't get the appreciation he deserved at times'”. Feedback on “'Maybe he didn't get the appreciation he deserved at times'”.